Connectionless protocol (UDP): This kind of protocol is preferred in cases where speed and efficiency are more important than the reliability. In this case the data is sent without establishing or waiting for a connection. This means that a bit or segment of data can get lost during transportation. A typical example of such protocol is live video streaming where sometimes bad connection results in the fragmented video. For example, imagine yourself bringing a bunch of letters to the postbox and dropping them inside. You are just dropping the letters inside the box without knowing whether they will be delivered to their recipients. This is the case with connectionless protocols. On the other hand, bringing all these letters to the post office and ordering a return receipt for them, thus ensuring their delivery, can be compared to a connection-oriented protocol. Connection-oriented protocol (TCP): Here the protocol ensures the receipt of a message at the other end without any data loss on the way, thus ensuring a reliable transport. The connection-oriented protocol needs extra overhead (discussed later) as compared to the connectionless protocol. Just like, it takes extra resources (time, money) to order a registered letter with return receipt. A packet contains data (payload) along with information (header) like source, destination, size etc. Just like a DHL packet that contains stuff to be shipped along with information like address, weight, dimension etc. packet size in networking, is the amount of data (in bytes) carried over the transport layer protocols. It is the extra information (in bytes) or features associated with the packet which ensures the reliable delivery of the data. In other terms, it is that bubble wrap foil around your shipment that is not necessarily needed but provides an extra layer of safety and reliability for a safe shipment of your parcel. The amount of overhead associated with the packet depends on the type of transport protocol used. UDP in comparison to TCP has smaller overhead. Bandwidth is the rate (bits/MB/GB per seconds) at which the data transfer takes place. The larger the bandwidth, the more data can be transferred at a given time. Message Queue Telemetry Transport or simply MQTT is a lightweight messaging protocol for industrial and mobile applications. It is best suited for application where network bandwidth and power usage are limited, for example, small sensor, remote location applications, machine to machine communication. MQTT communicates with a server over TCP and unlike HTTP works on publish subscriber model (see figure below). In order to understand the concept behind the MQTT, one should try to understand the underlying architecture “The publish-subscriber model”. Here a client publishes a message or a topic (temperature, humidity) to a broker that in turn sends these topics out to clients interested in subscribing to that message. The publish subscriber model used in MQTT offers a couple of advantages as compared to the standard client-server model used in HTTP. Multicast, scalability and low power consumption are among the top three. These advantages are due to the fact that the publish-subscriber model overcomes some of the structural (one to one communication, tight coupling, fault sensitive) drawbacks of the traditional client-server model. Let’s have a look at an analogy in order to understand the difference. Let us assume that MQTT and HTTP are two publishing companies: MQTT publishes magazines on various topics (sports, politics, cars, etc.) and provides them to a broker who in turn distributes them to subscribers interested in one or more topics. This way MQTT can cater many (multicast) subscribers at a given time, thus it is scalable. Since he only has to deal with a broker whom he contacts once a day, his investment (power consumption) in maintaining the business is not high. Constrained Application Protocol or simply CoAP, is a UDP based protocol, which is mostly interpreted as a light version of HTTP (except the fact that HTTP works over TCP). It is specially designed to work in a constrained environment with limited bandwidth and power constraints, where communication has to be fast and ongoing. Unlike HTTP, CoAP can support one to many (multicast) requirements and is faster than other TCP based protocols which makes it a good choice for M2M. It is quite common to see the device to device (D2D) or device to gateway (D2G) communication done over CoAP and the communication between gateway and cloud is HTTP job. This is due to the fact that there is a well-defined mapping between these two protocols. What about HTTP? It is on demand whenever you want to push a big chunk of data from gateway/industry modem/computer into the cloud or a web-based application without compromising on security. Here regardless of how data is collected and sent to a gateway (CoAP vs MQTT) if it comes to reliable big package delivery, then HTTP takes the front seat. Moreover, HTTP is still used as a standard protocol for devices who do not support any other protocols. MQTT or CoAP or HTTP, it is a matter of speed vs reliability vs security, whichever suits your use case the best. I hope you enjoyed reading the article and that it helped you to get at least a basic understanding of the major IIoT protocols. Your feedback, comments or suggestions are always welcome. What are common features of IIoT and SCADA/HMI and differences between them? And what advantages do Internet of Things Platforms have over SCADA systems? Find out answers in our new presentation. 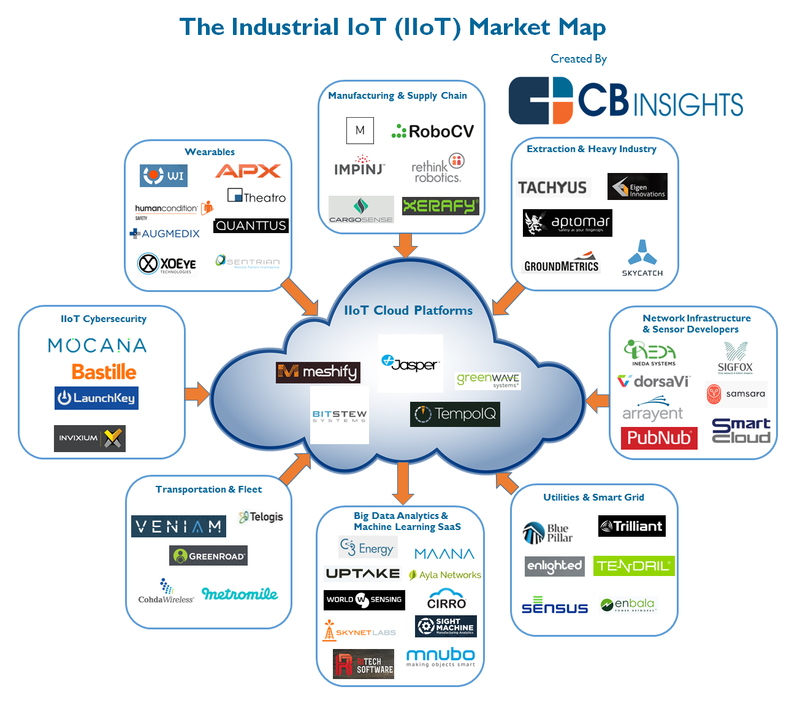 The industrial IoT has already proven its versatility with deployments going live in a number of enterprises, showing off dozens of different use cases. But a few key uses consistently present themselves within the same trade, and even throughout different industries. Keeping assets up and running has the potential to significantly decreasing operational expenditures (opex), and save companies millions of dollars. With the use of sensors, cameras and data analytics, managers in a range of industries are able to determine when a piece of equipment will fail before it ever does. These IoT-enabled systems can sense signs of warning, use data to create a maintenance timeline and preemptively service equipment before problems occur. By leveraging streaming data from sensors and devices to quickly assess current conditions, recognize warning signs, deliver alerts and automatically trigger appropriate maintenance processes, IoT turns maintenance into a dynamic, rapid and automated task. This approach promises cost savings over routine or time-based preventive maintenance, because tasks are performed only when they are needed. The key is to get the right information in the right time. This will allow managers to know which equipment needs maintenance, maintenance work can be better planned and systems remain online while workers stay on task. Other potential advantages include increased equipment lifetime, increased plant safety and fewer accidents with negative impact on environment. A smart meter is an internet-capable device that measures energy, water or natural gas consumption of a building or home, according to Silicon Labs. Traditional meters only measure total consumption, whereas smart meters record when and how much of a resource is consumed. Power companies are deploying smart meters to monitor consumer usage and adjust prices according to the time of day and season. Smart metering benefits utilities by improving customer satisfaction with faster interaction, giving consumers more control of their energy usage to save money and reduce carbon emissions. Smart meters also give visibility of power consumption all the way to the meter so utilities can optimize energy distribution and take action to shift demand loads. A study on the maturity of asset efficiency practices from Infosys and the Institute for Industrial Management (FIR) at Aachen University revealed that 85% of manufacturing companies globally are aware of asset efficiency, but only 15% of the surveyed firms have implemented it at a systematic level. Infosys and other supporting companies including Bosch, GE, IBM, Intel, National Instruments and PTC have launched a testbed with the main goal of collecting asset information efficiently and accurately in real-time and running analytics to allow the firms to make the best decisions. The goal of asset tracking is to allow an enterprise to easily locate and monitor key assets (e.g. raw materials, final products, and containers) and to optimize logistics, maintain inventory levels, prevent quality issues and detect theft. One industry that heavily relies on asset tracking is maritime shipping. On a large scale, sensors help track the location of a ship at sea, and on a smaller scale they are able to provide the status and temperature of individual cargo containers. One benefit is real-time metrics on refrigerated containers. These containers must be stored at constant temperatures so that perishable goods remain fresh. Each refrigerated container needs to be equipped with temperature sensors, a processing unit and a mobile transmitter. To continue reading, please visit the full article on Industrial IoT & 5G. IoT technology aggregatesand communicatesinformation to the carrier to be evaluated. To identify potential correlations and create predictive models that produce reliable underwriting and pricing decisions, auto insurers need massive volumes of statistically and actuarially credible telematics data.